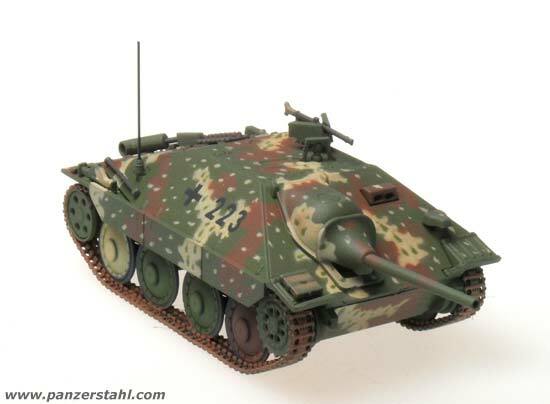 The design of the Hetzer was planned in December 1943 and already in January 1944 a wooden mock up in 1:1 scale was shown to the HWA. 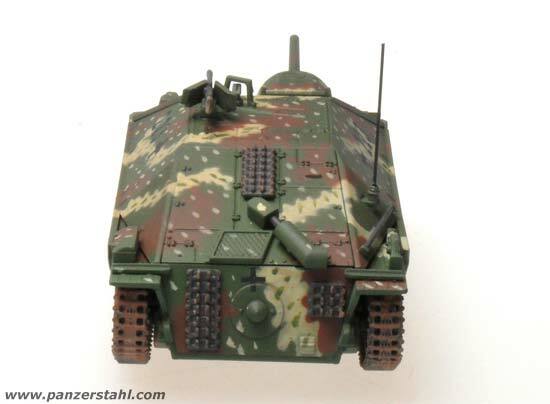 The design based on the undecarriage of the Panzer 38(t) with four slightly bigger roadwheels per side and with a comple new and angled superstructure in which a 7.5cm PaK39 was installed. 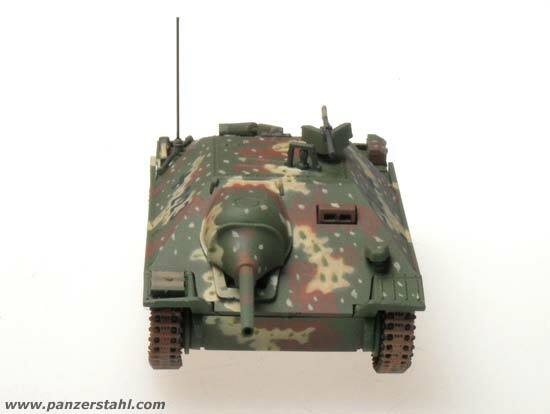 The Hetzer was armored with 60mm plates at the front and 20mm at the sides. It got the Praga EPA engine with 160hp, which allowed a top speed of 40km/h. 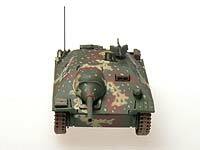 The first prototype was delivered in March 1944 and tested extensively. Several areas needed to be reworked and from May 1944 some items were changed, just as another gun mantlet, different idlers, etc. 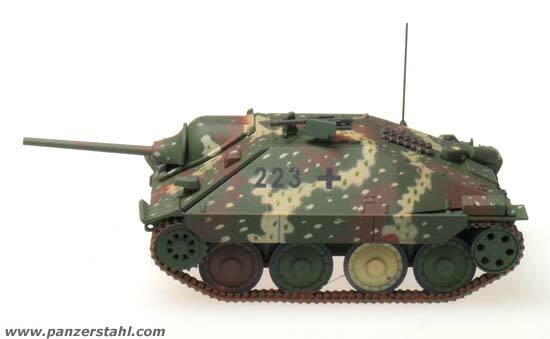 In the following months there were frequent changes in the series production - mainly in the appearance of the gun mantlet and idler wheels. The later one had no less then 6 different designs. The mid production featured also the omission of the heatprotecting mesh around the muffler and from October 1944 on a new designed Flammvernichter-muffler. also several internal changes were introduced. 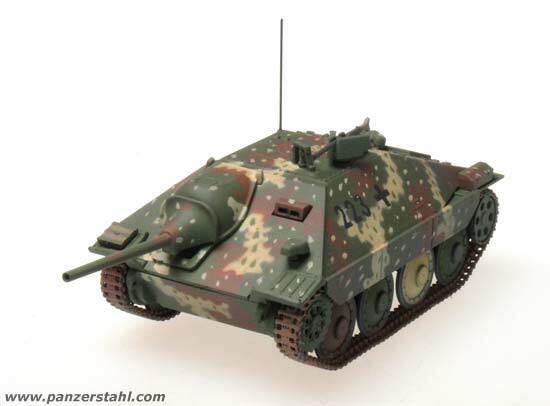 The Hetzer was 6.27m long, 2.63m wide and 2.10m high. 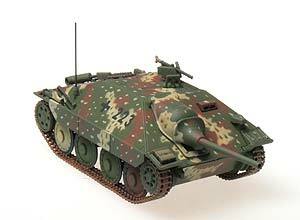 It had 35cm wide tracks with a ground pressure of 0.78kg/cm². 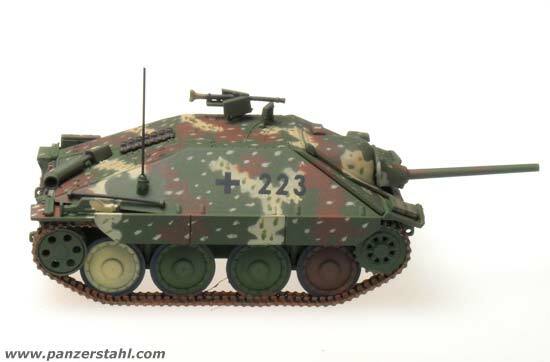 All in all 2584 Hetzer were produced until the end of the war. 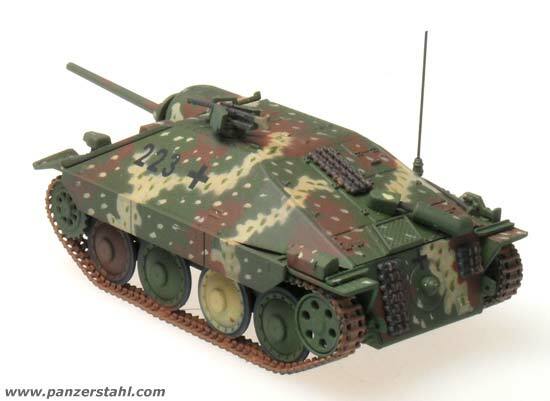 The Heeres Panzerjäger Abteilung 741 was raised under command of Heeresgruppe Mitte in September 1943 on the Eastern Front. 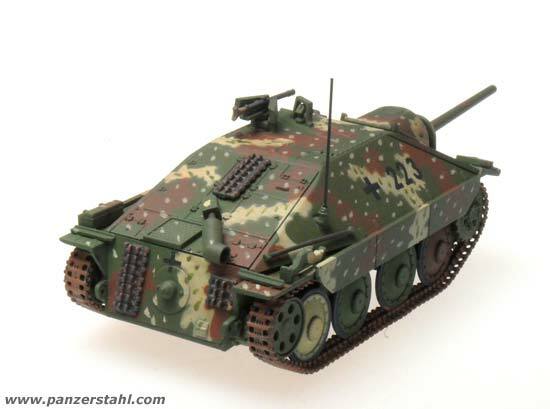 In September 1944 they were reorganized receiving 45 Jagdpanzer 38 "Hetzer" and being transported from East prussia to the Western Front. Until February 1945 they fought then under diffent commands in the areas of Boxmeer, Aachen, Venlo, Bastogne. then they were transferred into the area of Goch and pulled back bit by bit to bridgehead Wesel back to northwest Germany. They finally surrendered in May 1945 somewhere near Wesermünde.